If you’ve lost most or all of your teeth, you don’t need to be told how dispiriting that can be. But dentures have come a long way in recent years, and here in Fresno, they’re not your only option. 1. Dentures are not the only replacement choice for missing teeth. Dental implants used alone or in combination with a partial denture is often a preferable option for patients. Whereas a removable appliance replaces only the visible parts of teeth, an implant replaces both the root and crown of a tooth. This has critical implications. Dental implants can prohibit bone recession that generally occurs following tooth extractions. Dental implants can deliver patients the near-normal ability to chew, speak, and laugh. 2. There are more than one type of denture. Most men and women are familiar with the removable denture that replaces a complete upper or lower arch. 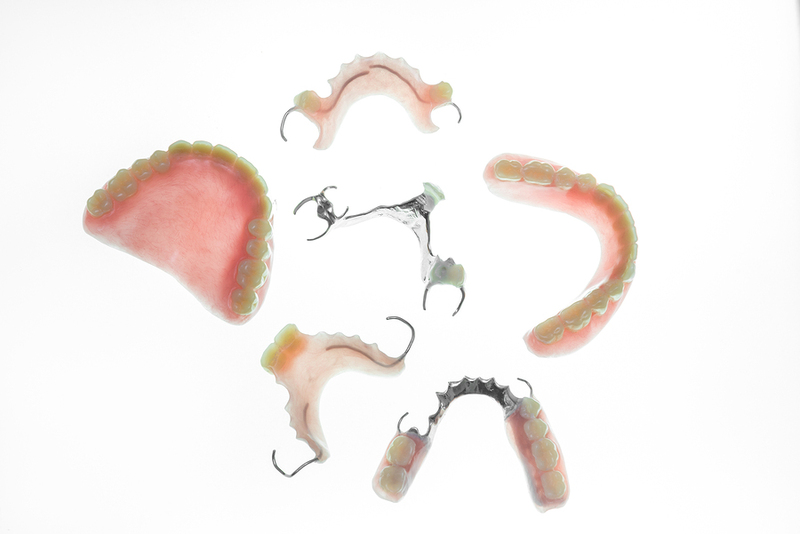 There are also partial dentures that are used for patients who have some existing teeth. Partial dentures can be anchored in the mouth or detachable. 3. Even if you have worn dentures for a while, you may be a good candidate for implant-anchored dentures. The critical factor is whether or not you have enough bone to support an implant. Bone grafting can augment existing bone in some cases. Schedule an appointment with us to find out if you are a good candidate. 4. Regardless of your tooth replacement configuration—full dentures, partial dentures, or tooth implants—you still need to practice proper oral hygiene. Removable appliances should be cleaned daily. 5. Even if you have no natural teeth left, it’s important that you have twice-yearly dental examinations. Optimal oral health is a fundamental component of overall physical well-being. We’ll examine your mouth for indications of diseases like cancer, heart disease, kidney disease, and diabetes. It is also a good idea for your dentist to examine the condition of your appliance. Dr. Art Mirelez, one of the most experienced and skilled dental professionals in the Fresno area, has skill with many tooth restoration services. Call us today to schedule an appointment.